The 20th Anniversary TBOX in 2015 was Awesome!!! MOVIE THEMED!!! We made it our platinum year in style, with plenty of Action, Romance, Comedy, and Drama! 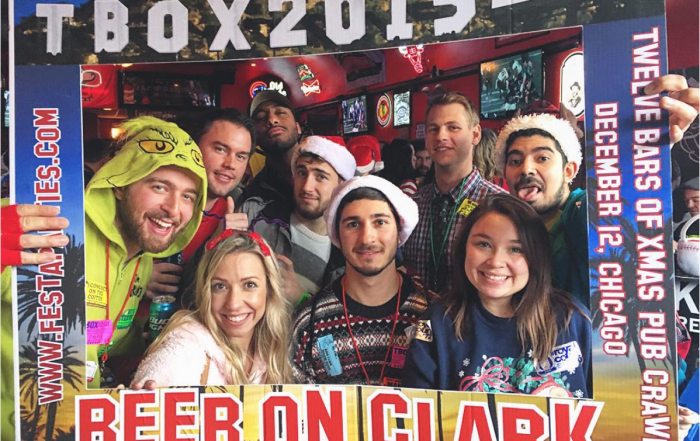 The 20th Annual Twelve Bars of Xmas – #TBOX2015 – was truly magical. In the Spring of 2015, Mr. Festa announced that the theme would be MOVIES… Comedy, Action, Drama, Romance, and Sticky Floors… everything you love about #TBOX!!! The bar crawl was GLORIOUS, with a precipitation-free day of OVER 60 DEGREES in Chicago on Saturday, December 12th (2nd warmest only to 73F in 1998!) – and amazing day for the #FestaPartiers from all around Chicago and the USA who came in for the big event. The Opening Ceremonies at Cubby Bear featured a 20-Year Retrospective of #TBOX since 1996, featuring Movie Clips and Music Videos and Songs from every year of TBOX… like Macarena, Semi-Charmed Life, Hot in Here, Hey Ya, Teenage Dream, Get the Party Started, Wedding Crashers, Old School, Jerry Maguire, Independence Day, and right up thru “I Can’t Feel My Face” and Fifty Shades of Grey! After the Countdown, we honored three lifetime TBOX legends – Fred, Fuji, and Peckham, who between them have been to more than FIFTY TBOX’s thru the years!!! We then had an awesome movie sing-a-long and the cutting of the green wire to start the crawl officially! Longtime TBOXers honored at the 20th Anniversary TBOX Opening Ceremonies with the Cereal Dump!!! The TBOX2015 Closing Ceremonies at Cubby Bear! Some Great Movie Costumes on Happy, Warm Crawlers at TBOX 2015 in Chicago! !